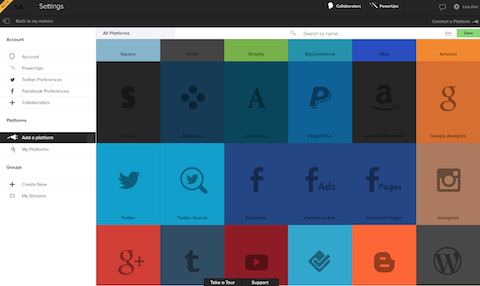 Mention and SumAll each offer a single dashboard so you can track mentions on social media, websites and blogs. With these tools, you don’t have to hop back and forth between networks to gather data to compare. In this article you’ll discover how Mention and SumAll provide all the data you need to get the big picture of your online presence. 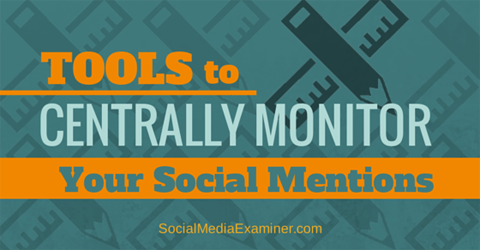 Find out how to centrally monitor your social mentions. Mention.net is a real-time Internet listening tool that lets you create alerts (similar to Google Alerts). But instead of pulling results from just news articles and blogs, Mention delivers results from millions of sources including social networks such as Facebook and Twitter. Mention also lets you monitor sources in 42 languages. Creating a Mention alert is easy: Simply click Create Alert and fill in the parameters.Name your alert (e.g., Social Media) and add any keywords you want to include in the search. You can add up to four ‘OR’ keywords. When you get your results, if there are too many or they’re irrelevant, you can filter them by adding ALL or NONE keywords in the advanced settings. In this example I used “social media” as a keyword phrase. Because it’s so broad, I added “Tips” to the “And all of the following words” section. Add the keywords or phrases you want to monitor. On the next screen, you can choose what to monitor. By default, all sources are turned on, but if you only want results from social networks, for example, you can turn off notifications from the web. Are there websites out there that you know are promotional or provide aggregated or irrelevant content? Add those website URLs to further filter your results. When you’ve customized your alerts, pull up your dashboard. On the far left you’ll see that you can sort mentions by priority, favorites, relevance and more. You can also quickly see the social accounts you’ve connected to Mention, as well as tasks, statistics and activity. In the next column you’ll see a preview of the mentions found based on the alert you created. Click on the preview to see the full mention in the reading pane to the right. 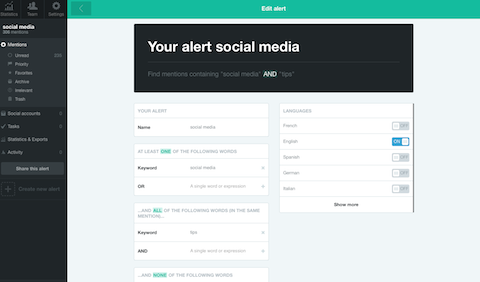 Scan your real-time alerts and read your mentions. You have the option to mark mentions as favorites, send them to the trash or flag them as irrelevant. Anytime you mark a mention as irrelevant, you’ll stop receiving mentions from that source—it’s a good way to further filter results and cut down on the noise. If you want to clear up your feed, but need to save a mention for later, you can archive it. If you’ve connected your social accounts to Mention, you can easily reply or join a conversation right from your Mention dashboard. Tasks allow you to share your comments and assignments with team members. You can keep up with assignments and tasks by clicking on Activity. See the number of mentions and where they came from at a glance. Click on Statistics & Exports in the left column to bring up the data for your alert. 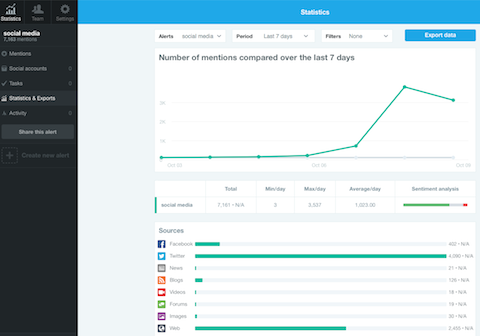 This shows the number of mentions from your alert, the timeframe and where those mentions are coming from. You can even see the country of origin and the languages used. If you want to save mentions and examine them later, use the Export Data button to create a downloadable file. Mention’s basic plan is free, but you’re limited to one alert. Paid plans start at $29 per month and allow multiple users and alerts. You can use Mention on their website, aniPhone or Android phone or by installing the Chrome extension. SumAll allows you to track activity across 50 platforms (including ecommerce) andcompare and analyze the connections among all of them. From social updates to emails to sales, you can easily track your traffic across the Internet. A partial list of the accounts you can connect to SumAll. At the top of your dashboard, you can easily choose what information you’d like to see. 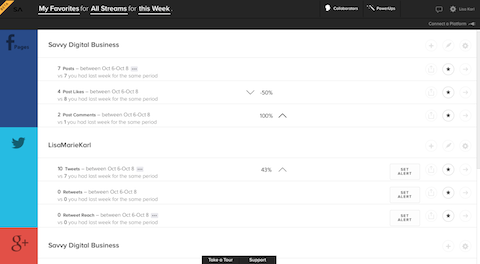 You can filter views for each account, stream and timeframe you want to compare. For example, you can compare performance on the third week of this month to the same week last month. SumAll’s clean and easy-to-read interface shows you how your networks are doing. On the far right, you’ll see that you can share account information with team members or see detailed information (via charts) about particular metrics (e.g., likes, comments, unlikes, etc.). You can also compare things like your number of Facebook fans and your number of Twitter followers. 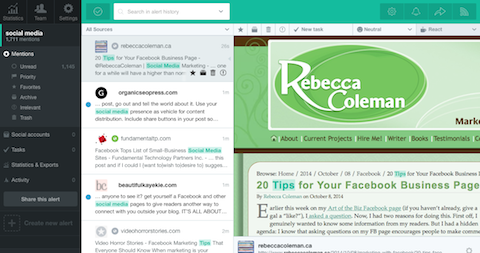 SumAll also offers a publishing tool for Twitter and Facebook pages. 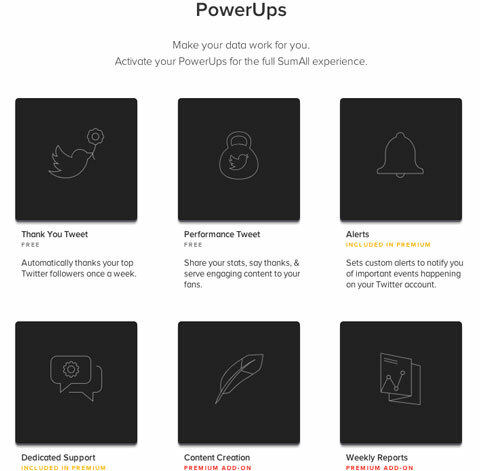 The Twitter publishing options are thank-you tweets to your top three followers, weekly performance and monthly performance. You can choose one or all of the options. SumAll has a number of automatic post options. The Facebook publishing option automates choosing and republishing the best posts from last year (these are published every Thursday as a Throwback Thursday post). Don’t worry about the post being cringe-making; SumAll emails you the post for approval beforehand. There are two plans offered by SumAll: basic (free) and premium ($9/month). With a premium account, you get an assigned SumAll expert, tips and access to new features first. You also get alerts if your posting frequency drops. In addition to the desktop version, SumAll also offers an app in iTunes and for Android phones. Caveat: Due to the private API, SumAll can’t connect your Twitter account. LinkedIn also isn’t available on SumAll at this time. There you have it! Mention and SumAll both give you important information so youdon’t miss anything along the way. With these two easy-to-use tools, you can monitor the Internet for mentions of your business and stay on top of your metrics without constantly jumping from network to network to check tags and analytics.